Instead of reviving my old blog (because it's so old it stinks. 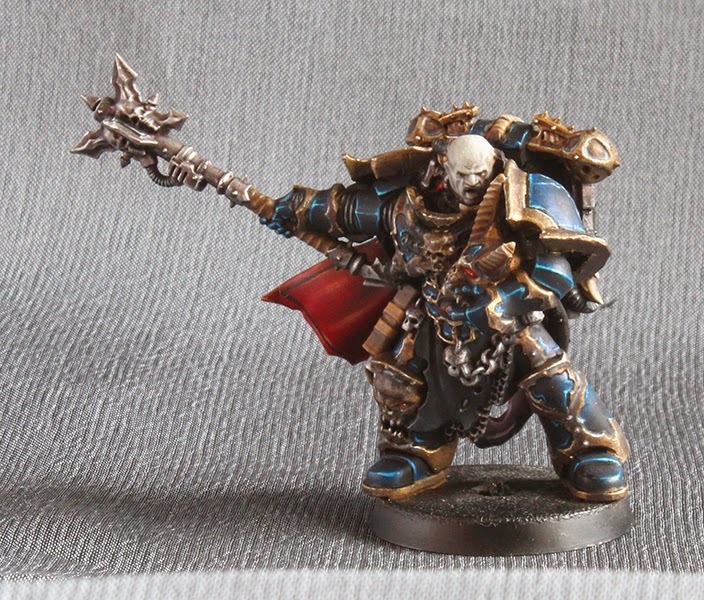 Also lots of links are broken there) I've decided to restart my whole conversions gallore with a brand new blog. 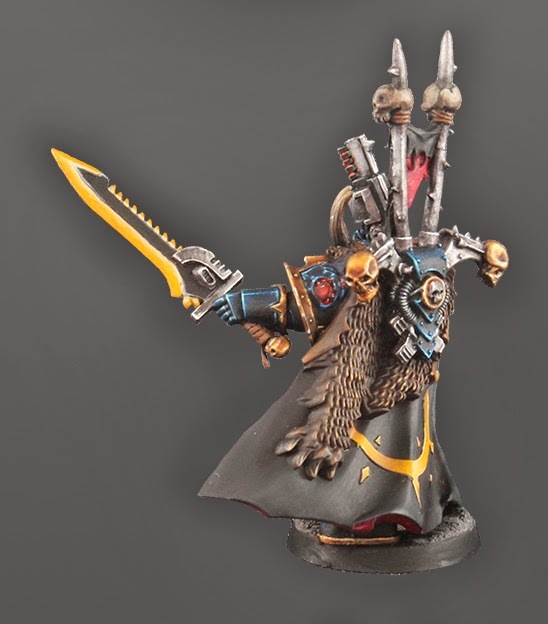 It would also mark my revival as a collector and new part of my army which technically was lost in Warp for good few millenia. - rock-band of "Horus Priests"
I have really clear ideas regarding each and every point, some of them already are at early stages of assembly. Again, I will post my general thoughts about miniatures, 40k and gaming along with new content. My goal is to share my thoughts and maybe provide ideas for conversions for other collectors. 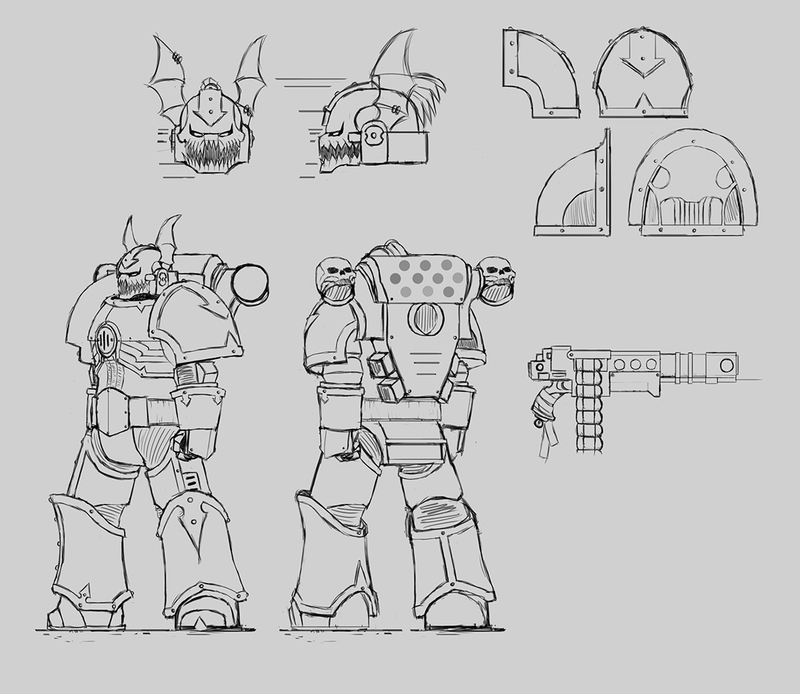 I also want to go back to the 3/4ed model style of chaos space marines, building a new army of space evil with all the skill and knowledge I have. Edited by DarkVen, 30 April 2017 - 10:19 AM. Chaos sorcerers and dark mechanicum work tirelessly to come back from the Warp. 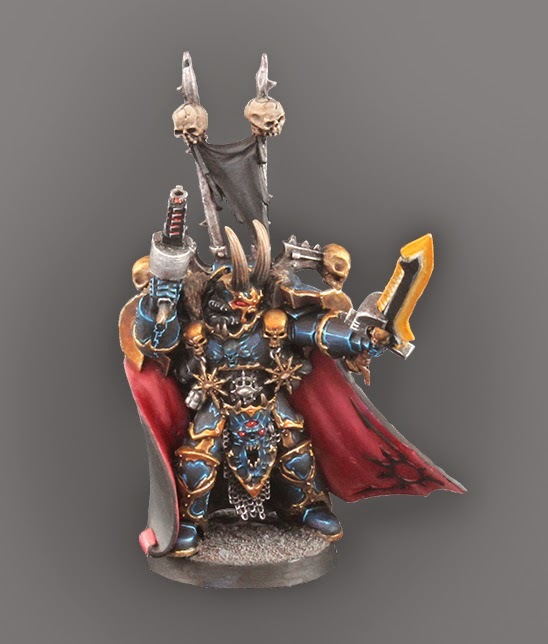 The two "new" Night Lords look spot-on; I'm really looking forward to seeing your next update! Aha. Good to have you back among us, old friend. You never cease to amaze. Anyway, really looking forward to whatever it is you have planned for this thread! Oh wow, talk about unexpected. I still have a couple of your pics saved in my inspiration folder. Your list is really interesting and the first two minis look great. Wow. This is amazing. I honestly never expected to see this happen. You, sir, are a living legend. When I first noticed the name of this topic pop up, I thought for a moment that someone had necro'd your old topic, but such was not the case. You are a legend, sir, of whom I only really know because Heinrich regarded you highly. You have my respect and admiration also. ... 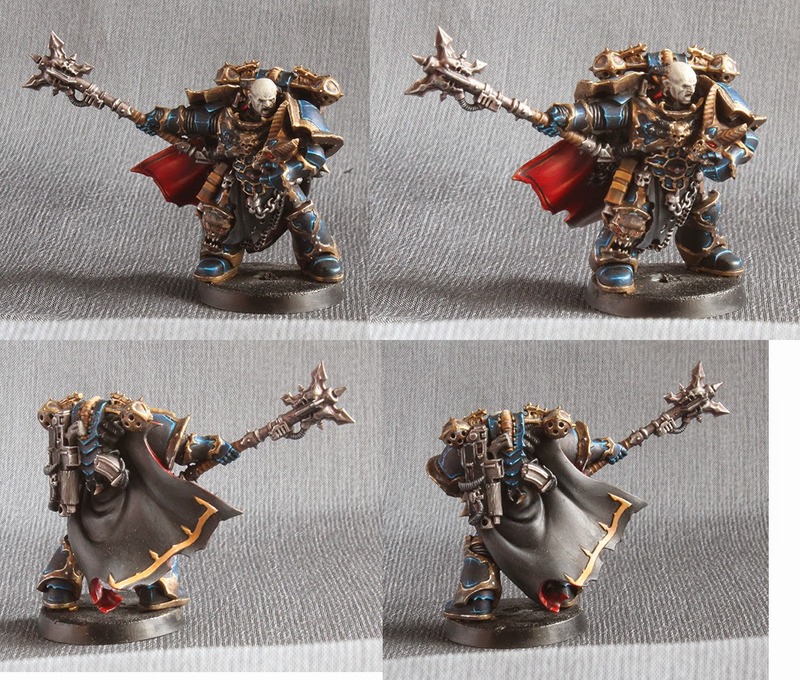 I'm rambling, aren't I. Suffice to say, the conversions and painting look beautiful (though you might want to clean up the Lord's cape a wee bit) and I am joyous to see your return. The bold yellow looks great, as do the converted daemons/beasts. Great to see you back, the new guys look good and I'm looking forward to see what's next. Many thanks guys for your replies it seems like you are still interested in this terror stuff. I think that first update with painting will happen next Sunday (19.6). 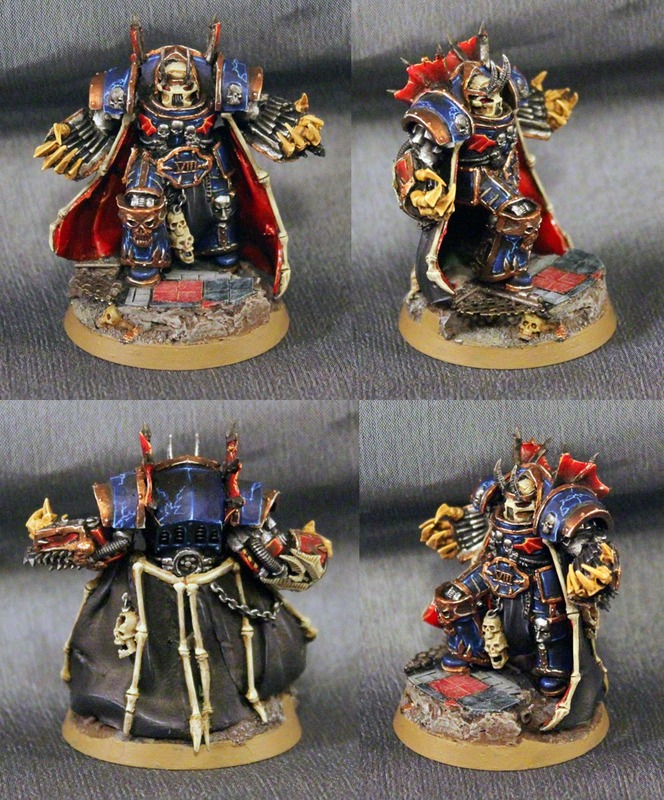 I'll paint the main characters (the Betrayer, the Sorceror and the Stylist) first and then go back to Night Lords. I need to recollect how to hold the brush properly, then I also need to find new brushes, gs and such... so it will take a little while for me to get back on track. Thank you! Actually these two were painted some time ago, with pretty long pause in between. But judging how they turned out even compared to my old stuff I think it will be quite easy for me to keep the same level of painting in terms of quality. It's good to be back well I hope I'll keep doing good stuff (knock on wood). Haha, let's just see if my mastery level is still at the same height as before seriously though, thank you for your kind words. Thank you! It's really nice to know that my stuff inspires someone I hope you will find new inspiration here soon enough! Thank you for your kind words! And you rightly noted, ehm, lack of quality on the lord. 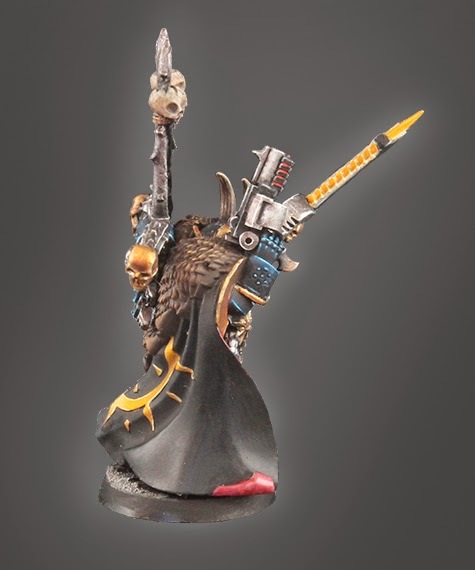 This is actually one of those miniatures I look at right now and think of myself: "It could have been done much better. Do not screw up like this next time". I'll keep it as a reminder of how bad lazy miniature can be. And because I've spent so much time building it it better stand as it is. Brother Heinrich is truly a great collector and a great representative of the VIIIth legion whom I admire myself. I wonder where is he? Many thanks! These are spawns and again I see know that I could have put much more effort and time in them to make them look better. The one in the middle is the only one I actually like. Holy wowsers good to see you darkven! I am one of those too who has saved all your work in an inspiration folder. Really excited to have you back in the fold! Looking forward to seeing new minis from you, your old stuff is still inspiring me today! Edited by BrotherJim, 14 June 2016 - 02:18 AM. AVE DOMINUS NOX, ladies and gentlemen! Wait. ALL IS DUST, ladies and gentlemen! Yeah... well I know it isn't exactly what you are looking for from me, but hey, I need to get started somewhere, am I right or am I right? And I beg your pardon for a delay it took much more time and effort than I've remembered. Nevertheless, here he is - the arch-sorceror, the one named Ahzek Ahriman. And being heluva miniature to paint he turned out to be better than anything I've painted so far I believe. I actually didn't want to turn this into "remembering stuff kinda painting", but I actually have forgotten that one should shake paints before applying them, painting during day time is much better than painting during night time etc. Besides recollecting old knowledge which slipped away from me during my big pause I've also learned a trick or two about painting, the first thing being "It's not about advanced painting technic, it's about how this stuff looks". Also glowing eyes - which were actually created in a spontaneous act of brave foolishness. I also really like the final look of his cloak (skirt? kilt?). He requires some additional work though - bones or the back of his cape, as an example. But I felt that I would be considered dead again if I would hold the update for any longer. I'll apply a few final touches to him and then post with another update. 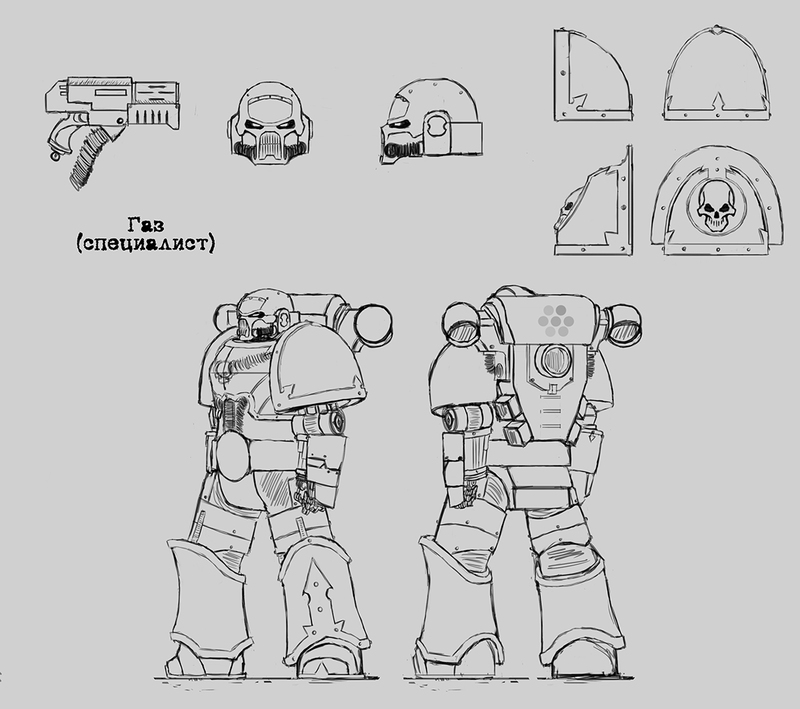 Which will concentrate on a dreadnought and another cult character of our codex. 26.06. 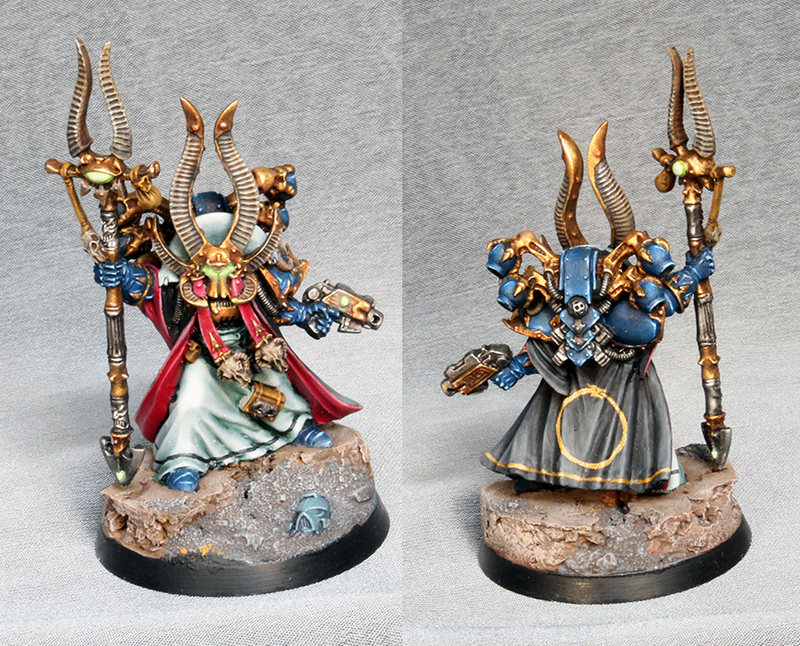 That Ahriman is incredible! I especially like how you have those striking reds and blues on him, and yet have gone for that equally striking off-white for his robes. The OSL is also really well done. You wouldn't know from looking at the model that you haven' painted anything for a while -- quite the opposite, in fact! Well I hope I will not dissapoint you! Your stuff was and still is a good source of inspiration for me. Many thanks for the compliment on the painting level, it's really nice to know that it looks good for other people. As for such Christamas-ish palette - I wanted actually to replicate the palette from GW's Ahriman original miniature... but then something happened and now he looks like a Christmas tree. BLOOD FOR THE BLOOD GOD, ladies and gentlemen! So next time you'll see painted dreadnought but this time I will take a bit more time (considering a week is obviously is not enough for me) and will post painted dread until 10th July. Edited by DarkVen, 29 June 2016 - 05:15 PM. Damn, your dread already looks absolutely menacing. The extended legs are a great idea. Love your paint job on Khârn too, you've hit the mark with that deep red. I'm not sure though about extended legs. Personally dreads look awesome because they resemble tanks. Well, the old patterns at least. Long legs actually brake this feeling for me a bit. 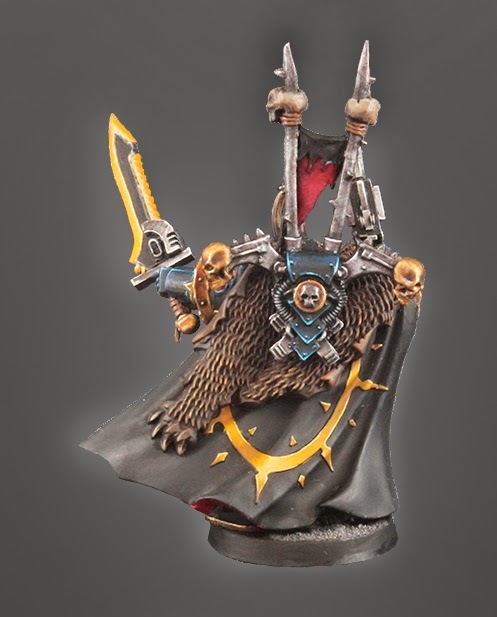 love the freehand ouroboros on the cloak! Many thanks I thought it was the best choice to fill in the empty space on his back. This or an eye. I went for ouroboros. Wow nice too see your painting is still flawless! 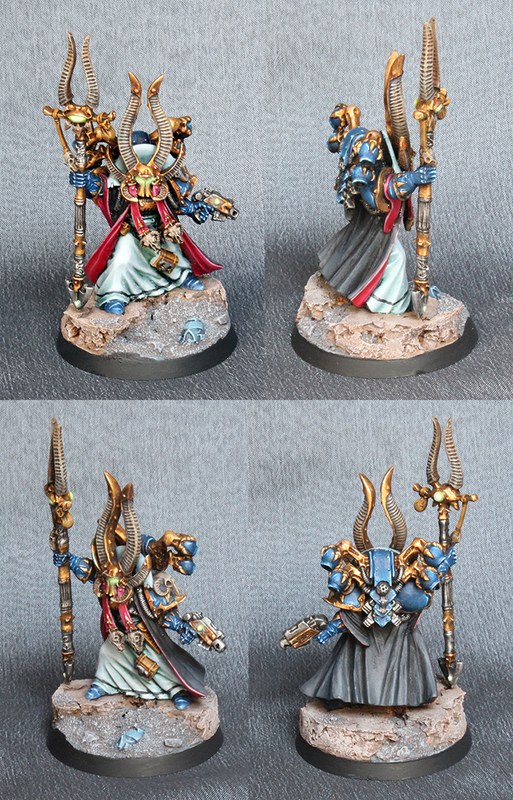 I wasn't sure about Ahriman, and I think it's the colours. Your right he does look a little Christmas treeish! 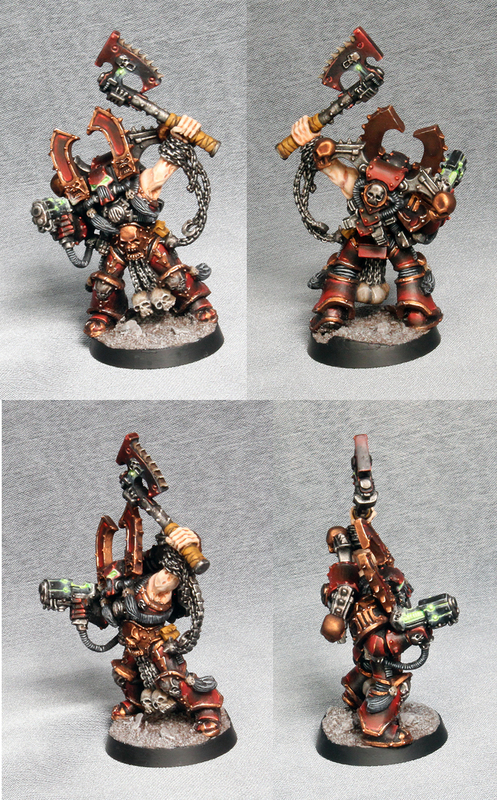 Khârn is absolutely perfect, I'm in love with the red and the OSL on the pistol and eyes is amazing! I love the dread, I have a simialr conversion (or 3,5 whatever.) Your right! They do lose their stocky tankness once you stand them up, but I still think it's worth it! I didn't realise what bothered me until you mention their tankness. They just seem less robust once they are upright. Still worth it but! Looking forward to colour! And some close ups of how you rebuilt the legs wouldn't go astray either! Well, Ahriman is the representative of Tzeeitzchevitz, god of change... I think he'll live with that palette on him. I still love your Gothic marines. Your Khârn likewise reminds me of those better 40k times. I also got some big ghouls to sort of style my spawn like yours. I'm far off on that. Well I have to post something from the legion of my origin still, and I think it'll be on Sunday or Monday. Speaking about spawns - I wondered almost nobody has used idea before (or at least not the people I know of). They fit perfectly, have same size and kind of "vibe", especially for NLs. Eagerly waiting for your turn on them. Thought might be interesting for anyone wondering what is coming up in a few weeks/months. I still don't have any idea how to sculpt those little wings on their helmets. Any advices guys? Edited by DarkVen, 08 July 2016 - 03:43 PM. The drawings are looking excellent and really rather promising!